This book presents a fresh, simple approach to working in watercolor. It's spirited and fun--just the kind of instruction that beginners will love. Clear-cut guidelines help readers select their first brushes, paints and palette. 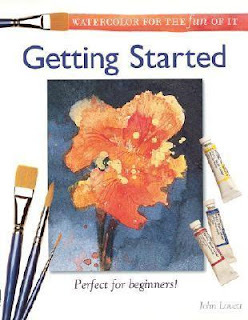 Step-by-step instruction makes mastering basic techniques easy, while tips and mini-demos detail how to render specific subjects, including trees, water, buildings and more. This engaging style makes Getting Started a must for all beginning artists--perfect for those who want to simply dabble in watercolor or dive right in! John Lovett trained at the National Art School in Newcastle and held his first one-man exhibition in 1973. He has held over 20 solo exhibitions and has also been involved in numerous group exhibitions. John now teaches and conducts workshops in his Currumbia Creek studio in Queensland, Australia. His work is on display in many galleries and has appeared in Australian Artist magazine.